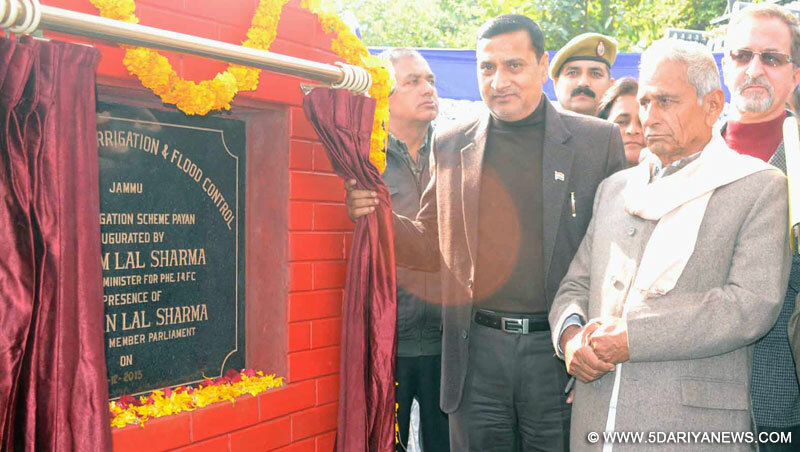 Minister for PHE, Irrigation & Flood Control, Mr Sham Lal Sharma today inaugurated Rs. 1.50 crore Lift Irrigation Scheme (LIS) at village Payan in Akhnoor block.The LIS has been developed along River Chenab and designed to discharge 10 cusecs water through 1200 meter channel. The scheme will irrigate over 300 hectare of land at village Payan and other adjoining hamlets.Speaking on the occasion, the Minister said that it is endeavour of the Government to provide better facilities to the people in every nook and corner of the State with special focus on the up-gradation of existing infrastructure. He said Government has been working under a well-knit programme to ensure all round development in all areas, especially in rural and far-flung areas.Congratulating the people for the facility of irrigation, the Minister said that the facility will change the socio-economic profile of the people of this kandi belt. He said Government will explore possibilities to develop more such schemes to add more areas under the ambit of irrigation in the belt. He said as many as 19 LISs were taken up along the river Chenab and on some potential nallahs in Akhnoor and majority of them are at the completion stage. These schemes are aimed at to create irrigation facilities in the dry belt which will bring prosperity in the area, said the Minister. Regarding drinking water, the Minister said during the past one decade 172 new PHE schemes have been developed in Akhnoor block and large numbers of villages have been covered with potable drinking water. He said efforts are afoot to provide safe drinking water to all uncovered areas, particularly in the hilly belt of Akhnoor. He asked the people to make judicious use of water and conserve the water resources. He said the PHE Department has empowered the PRIs to oversee the supervisory part of the Department and also to conduct regular testing of water with the help of testing kits provided by the Department to ensure safe drinking water to the rural masses.Responding to the demands of the people regarding bringing some villages under the category of Backward Area, the Minister said that the demand will be examined by the concerned authorities as per the norms. He assured that Government will explore possibilities to generate more avenues of employment for the educated youth of the area. He asked the youth to avail benefits of various flagship programmes of the Government which are aimed at to generate employment under self-financed ventures. He said Government jobs are not possible for all and youth must avail self-employment options for their livelihood. Asking the people to give higher education to their children, especially the girls, the Minister said the education is the only source which can help the children to grow and prosperous in the society. He said Government has strengthened the network of education in the rural areas to provide quality education at the doorstep of students. The students must avail the benefits of this facility and secure their future and serve the society, said the Minister.Chief Engineer, Irrigation & Flood Control, Mr. Sushil Aima, Superintending Engineer Hydraulic, Mr. Rajiv Malhotra, SDM, Akhnoor, Mr. Girish Dayalan, prominent local leaders including, Bhagat Ram Saran, Thakur Kamal Singh and large number of Sarpanchs and locals were present on the occasion.